You know the area around Romney and Hythe in Kent, England has a lot of exciting things to see if you are thinking of a family holiday in the UK because the government have taken all of your money and you can’t afford to go somewhere really nice like err… Spain or where the bankers and the politicians who created your newly found poverty go… the Caribbean. Still Romney and Hythe has some interesting sights, scenes and sounds for all the family. First of all there is the Royal Military Canal a long flat waterway built for use during the Napoleonic Wars once captured by the french it would have proved invaluable for transporting men and supplies and creating a much wider bridgehead very rapidly. The canal lies flat in some of the prettiest countryside the flat lands of Romney Marsh so it is best seen from bridges. 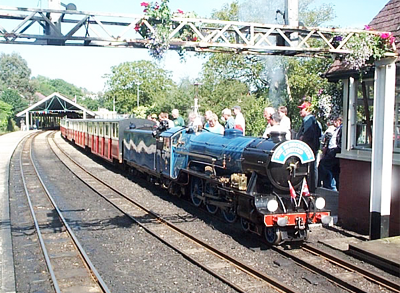 The Romney, Hythe and Dymchurch Light Railway which is the world’s smallest public railway is a child’s dream and starts near Hythe town centre and runs fourteen miles across the Romney Marsh to the shingle headland of Dungeness. Dungeness is home to two interesting landmarks the first is a near derelict lighthouse where unsupervised children can climb out onto a ledge hundreds of feet above the ground and lean over a rickety Victorian railing. From so far up they can see the coast of France a few miles away, the beautiful Romney Marshes on their left and the enormous Dungeness Nuclear Power Station to their right. The nuclear power station is also of interest to the casual visitor not only because of its location on the coastline but also because it bears a striking resemblance to the Fukushima Daiichi Power Station in Japan. 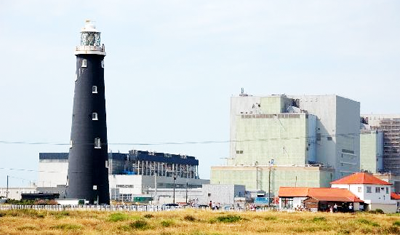 In fact they share the same nuclear reactors though of course currently the Dungeness ones are not in meltdown. Four miles way lies the hamlet of Port Lympne which has nearby the internationally renowned Port Lympne Wild Animal Park. If after one or two days holidaying in this area and you do get bored why don’t you pass the time by looking at some of the signs around, like this one and try and work out why the obviously needs to be stated so dramatically? Oh by the way don’t whatever you do go into the sea at Dungeness or along most of the coastline, the beach drops away dramatically underfoot and so in some places if you take three or four strides into the sea the next one will mean you are completely and utterly out of your depth. 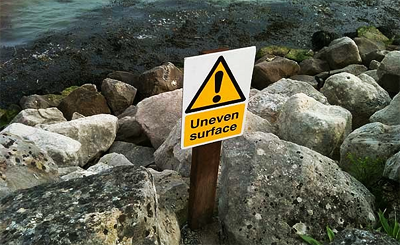 To make matters worse usually the sea is rough which means if you are not a confident swimmer you will be in trouble. Some say that the Kent coastline is polluted and with radioactivity from the Nuclear Power station and the local Water Company’s rather inefficient treatment of wastewater, which at times of great ‘demand’ means that raw sewerage is pumped into the sea so it might be an idea to avoid the coast completely.